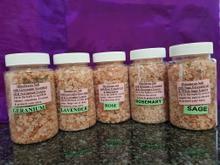 Use in the bath to remove the negativity of a psychic attack & protect your aura. 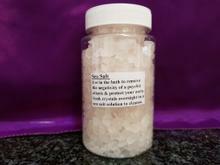 Soak crystals overnight in a sea salt solution to cleanse. Throw at the front gate and at the 4 corners of your property to prevent intruders entering. Or place in 4 corners of your bedroom to absorb any negativity or unwanted intrusion in dream-state. 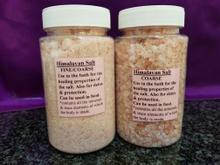 Use in the bath for the healing properties of the salt. Also for detox & protection. Can be used in food. 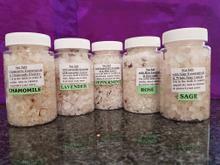 *Contains all the minerals & trace elements of which the body is made. 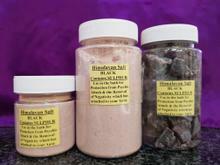 Himalayan black salt. Contains Sulphur. 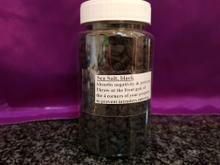 Use in the bath for Protection from Psychic Attack & the removal of Negativity which has attached to your Aura. *Sulphur smells terrible! but in combination with the salt does the job!. 300gm. 9 varieties. Coarse salt.